My current project: making 365 blankets in one year. Be sure to explore the rest of the blog as well. I can hardly believe it is already the end of August, and I started this Toy Truck Tutorial in February! 'Life' got busy and I forgot to post the rest of the photos of how I made the truck and how it turned out. Here is the pattern again, and as for size, you can blow it up or shrink it down to whatever size you want. Just keep in mind that the final toy size will be about 3/4 of an inch smaller, so account for seam allowance when figuring size. Note: I skipped the headlights, since I was making a tiny truck, but you could make them just like the windows. Also, I used buttons for the wheels. Find some material that you like, this is a great turquoise and cream print from Jo-Ann's, fold the fabric over so you have the right sides out. 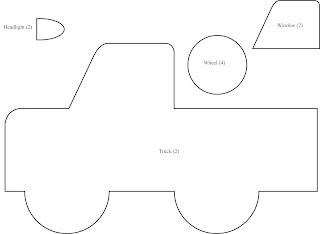 Pin the fabric together and cut out the truck shape, now you have the front and back of you truck, and you only had to cut them out once! Iron on your windows and layout the rest of your embellishments, I went with dark green ric rac and turquoise buttons. You will need to guestimate how long you will need your center strip to be, this is what makes the truck 3-D. I think this one is about 2.5 inches wide, and I don't remember how long it was, I made it 6 months ago! You can make the strip wider if you want to, but I wouldn't go any narrower. Sew the two sides together and leave an open slit across where the bumper of the truck would be, this is how you will turn it inside out. Tip: be careful to keep your center strip at a 90 degree angle when starting the second round of the truck, if you don't, the truck will be kitty-wampus. Note: it is not easy to sew the two sides together, small toys are difficult to sew. If you are a beginner, I would recommend sewing a larger version of this truck. Turn the truck inside-out, this isn't easy either. Ta Da, it does't look so great at the moment, it actually looks like it was in a crash, but just give me a sec! Oh, and see on the right side, that is the bumper opening I am talking about, which you use to turn the truck inside out and to stuff the truck. There, isn't it adorable! Every little boy needs a truck like this! Especially when it is made for them by a loved one! 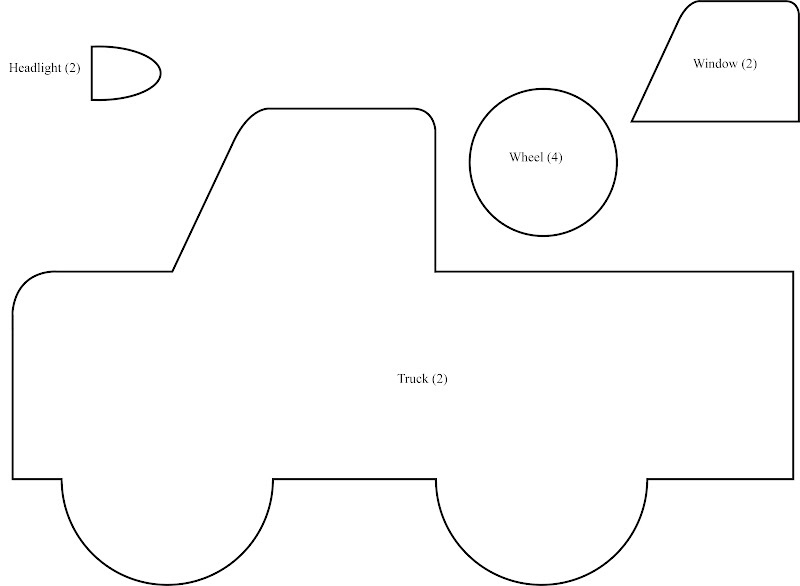 The last step to making the truck is to stuff it until it is evenly filled out and then hand-stitch the bumper closed. I am: happily married, the proud mama of a beautiful baby girl, currently a stay @ home mom, but thinking about going back to school, kind of looking for work as a nurse, the aunt of 3 lovely nieces & 5 adorable nephews, artistic and crafty, a party planner, I like to garden, sew, scrapbook, knit and crochet.